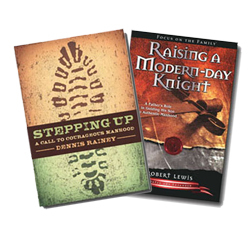 Save 41% when you buy Stepping Up and Raising a Modern-Day Knight together! What exactly is a father's role in guiding his son to authentic manhood? In this dynamic book for fathers with sons, Lewis provides biblical principles, and practical examples for a dad to use to equip his son for the "higher things" of manhood. Features include helpful guidelines for the use of creative manhood ceremonies to commemorate key passages in a boy's life, such as transitioning from childhood to puberty, and releasing him into marriage.